Learn how to get your Squad working for you today! 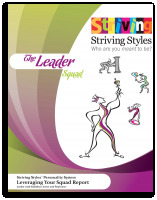 Understanding the role each Striving Style plays in your personality and how each improves and enhances the functioning of the others, is key to the fulfillment of your potential. I had no idea how much my need to be secure was keeping me from experiencing life. Knowing this has given me the courage to start a new career."